So, a while back I decided enough was enough – the belly with faint six pack traces had to go. Yes, faint ‘fault’ lines reminding me of my past fit self and how things were sweet. How beautiful ladies at my workplace used to get hot and bothered when I walked into the office (well, all ladies but except one). Which as it turned out caught my attention. Before we proceed, I think some back story is to help you understand where I am coming from and probably even serve as an encouragement to someone going through the same. … before I quit my job in the corporate world, though I used to work from 8-5pm like any white collar employee, I somehow managed some time to hit the gym before I headed home to relax and cool off in preparation for the next day. I worked out for two hours every day and with time had a sculpted figure that had all ladies, and even some men intrigued. After years of working for the same company, I thought it was time to move on to greener pastures. This thought coincided with my cousin approaching me with an entrepreneurial venture which seemed promising enough and able to provide me with the future I had envisioned. The thought of being my own boss was intoxicating, and I couldn’t get my mind out of the clouds, dreaming of how I would travel the world. But this dream was never to be realized, well, at least not in the way I dreamt it. No one told me that running your own business is harder, tougher and calls for you to work longer hours than in normal offices. I wasn’t prepared for the inevitable fall out with my workouts and the fat build up that would follow after. With all the business meetings and responsibilities, the only time I wasn’t at work is when I was at home relaxing for a few hours or at night sleeping off the fatigue. This went on for a while until finally; I had enough and decided to take charge. I picked up my laptop one night and entered ‘home workout equipment’ as my keyword on Google. The searches I got were enough to impress me and give me hope. But it wasn’t after a long search that I finally came across the Bowflex PR1000 Home Gym. It turns out; this machine is one of the most popular workout machines on Amazon and many other e-commerce platforms. The Bowflex PR1000 is a cardio training machine that helps to maintain fitness levels and increase stamina. The equipment is also known to significantly strengthen muscles using more than 30 inbuilt programs. We shall have a deeper look at this later on. I purchased the equipment after reading several reviews online, and I must say, for the three months I have been using the equipment, I have experienced tremendous results. Sure, I am not where I once was, but am definitely en route to success and being a lady magnet once again. In my search for a home workout equipment, I came up with a list of features that would guide me purchasing the best machine available. At the top of the feature list was a range of back support positions the equipment provides. As well as the ability to make available varying exercise variations with both low and high cable pulleys. A combination of these two features is what makes the Bowflex PR1000 popular and unique. In total, the machine supports a total of 30 different workouts designed to help you work on different muscle groups for a well-balanced workout. The sitting bench features a main sliding track which makes switching between the varying workout positions a breeze. These positions will have you lying at different angles ranging from a 0 – 45 degrees inclination. It can be free sliding if you prefer it to be such by removing the main back support. Speaking of which, removing the seat will provide you with more room to perform a wide range of exercises including the upright rows and standing bicep curls which I particularly love. Big up to the manufacturers for thinking of this feature. It is clever and downright creative. Being a home exercise equipment, the Bowflex PR1000 needs to be just the right size to operate like regular gym equipment. But seeing that you will be using it in a more restricted space, it needs to be able to be stored away when not in use. The foldable seat rail makes this possible. Simply lift the rail from the front, vertically fold the rail and bench and lock it in place at the bracket on the seat rail. This reduces the floor space the unit takes up. One of the major differences of the Bowflex PR1000 with other home gym cable machines is the resistance design and control. While most of the commercial home workout systems use weighted plates and several cable pulleys that collectively develop resistance as required, this particular product makes use of power rods to create lower and higher levels of resistance depending on the number of each you decide to use. In total there are 5 power rods on each side of the bench. To achieve the desired weight resistance, you can very well combine several power rods. The frame has been constructed from steel. Even though the equipment has been rated perfect for use by users who are 300 pounds and below, being a steel machine, it is sturdy enough to support even heavier individuals. The only thing is that the roller on the seat may wear off fast. In addition to being constructed from steel, the frame has been coated with a scratch resistant and anti-corrosive paint. The frame measures 84 x 38 inches and has a height of 81 inches. Simply put, the unit will fit perfectly in a room with a 7 feet ceiling and still leave you with 3 inches to spare. Going with the measurements of the equipment, you will need a workout space measuring 100 inches in length and 78 inches in width. This is because the resistance rods are designed to bend on the sides thereby increasing the width of the machine. Also, if you will need to perform leg extensions or rowing exercises, you just might need extra room on the length. The equipment comes with 3 stabilizers on its base. Each of these stabilizers has rubber feet which help in protecting the flooring as well as increase the equipment’s stability. The fact that it does not feature wheels makes it clear that the unit is not meant to be moved while it is fully assembled. The Bowflex PR1000 comes with a leg attachment and 10 cm roller cushions that provide ample protection and comfort while taking up leg exercises. You should, however, note that the leg attachment does not support leg curls and only supports leg extension exercises. As stated earlier it features pulleys designed from heavy duty material and sports high-quality ball bearings. The hand grips for superior support are covered with rubber foam. The cables used to connect the resistance rods and the grips are made from steel and are durable and strong. Being a home fitness equipment, this is probably the advantage at the very top of the list. You get to set your own workout routine and timings. You have the freedom to start at your tempo and build on it as you are comfortable. Adding to this, having this equipment at home, you will not have to wait in long queues waiting your turn just to have a go at what you have paid for already. Speaking of which, this equipment will save you a great deal of cash on gym memberships. These parts are cushioned and smoothened which allow for effective leg workouts and exercises requiring pressing on the hand grip. The cushioning helps improve the comfort on the machine as well. The equipment can provide positions for various bench presses including the horizontal decline. Also included in the workouts are low back extensions, seated lat rows, and rear delt lat rows. You will have to assemble the equipment yourself. The manufacturer, however, makes available a straightforward and comprehensive manual. It is safe to say that the equipment is one of the best there is. What is even better is the fact that for its high quality, the product goes for a fair price. The machine is perfect for beginners but also for intermediate and advanced users as well. You should, however, bear in mind that the product is not complete since it lacks in a lat bar which would be perfect for butterfly exercises. While the PR1000 is in itself a complete package, there are some items that you could add to it to give it more convenience and to suit your workout regimen even better. One of these additions is the Champion Cable Attachment Package Pack. This product, needless to say, is ordered as a supplement. It comes inclusive of three products; a rope cable, a triangle bar and a straight bar. All these items are well made and are as strong as they can be. The bars are made from stainless steel and are durable. I use the rope to work on my abs and triceps, the straight bar for my biceps curls and the triangle bar for my triceps presses. I must say that the resistance band handles that come with the home gym are pretty narrow and may at times scrape the sides of your hands. Adding to this, I also find them to be too thin which makes getting a good squeeze from them slightly difficult. These handlebars are however different. They are thick and wide which is perfect. These handles that come with two carabiners are also compatible with resistance bands that have ‘D’ rings and ‘O’ rings. There is no going wrong with this product. A perfect addition to this workout equipment. If you are new to working out and have no idea of any exercises, or if the home gym looks all complicated for you, you will need a guide to light up your path to success. This book by Darden, an exercise scientist shares on some of the exercise routines that you could get into. He describes the exercises designed to improve weak arms, sagging derrieres, and flabby stomachs in detail. In addition to this, in the book, he also makes available a muscle promoting diet that will help you achieve your workout results even faster. Needless to say, this manual is a must have for all looking to purchase this home fitness equipment. This is a great machine when quality and price points are considered in relation to the service that it provides. 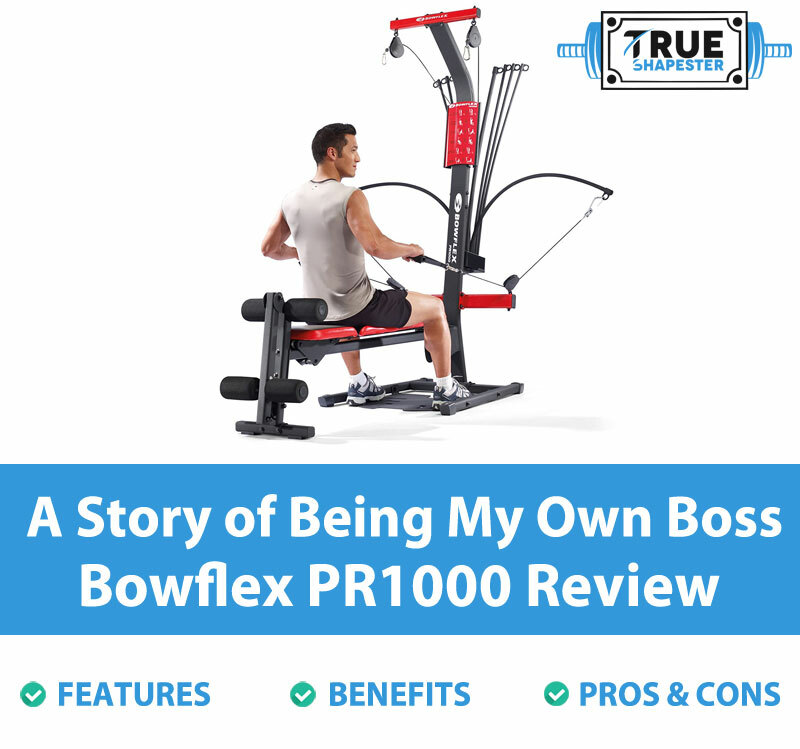 In this Bowflex PR1000 home gym review, we have gone through several features as well as pros and cons. We have also seen that the product provides more than 30 workout exercise options which will help you get back in shape in no time. Now, setting up a home training machine can prove to be quite a tedious process and one that requires a lot of money. However, with the Bowflex, you are assured of diversity without having to drain your bank account.